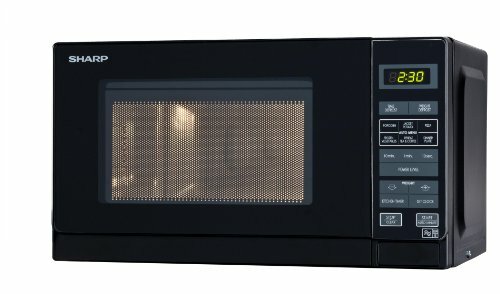 Next up in our increasingly large solo microwave review section is the somewhat plain looking Sharp R272KM. This touch control microwave features a modest 20 litre capacity, complete with an 800w power output, and is finished in a nondescript black design. Looks smart, easy to use. Well constructed, and simple to both maintain and operate. Black colour scheme may not suit all kitchens. The Sharp R272KM is finished in a sleek and stealth like black exterior, with clearly labelled controls. This particular model is a compact solo microwave, with a 20 litre capacity. Overall dimensions are 43.9cm by 25.7cm by 35.8cm, with an interior measuring 30.6cm by 20.8cm by 30.6cm. Inside you'll find a removable 25.5cm diameter turntable, and the overall weight of the microwave is 10.9kg. 11 different power levels are included, which go up to a maximum of 800w - also included are 8 auto cook and defrost options to save you time. In terms of style and design, it is reasonably plain looking - however this can be seen as an advantage, as not only will the design not date, but also it will suit the majority of kitchen colour schemes. Build quality is pretty good, as you'd expect from Sharp appliances - and the microwave cooked efficiently, with no uncooked spots or cold areas. The touch controls are situated to the right hand side, and are easy to operate - the LED display is pretty clear too - overall our testers liked this model. Overall a solid 20 litre solo microwave from Sharp - it's easy to use, and works well. We would highly recommend the R272KM - it does exactly what it says on the box with the minimum of fuss, and should prove to be a reliable investment.